The choir of the First Presbyterian Church will present its Advent Cantata, Shout the Good News!, during the 10:30 AM morning worship service December 16, 2018. 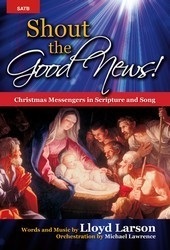 In Shout the Good News!, the composer Lloyd Larson has created a celebration of Jesus’ birth and of those messengers who helped God’s purposes to be fulfilled. New material is blended with beloved carols, creating a rich tapestry of music for Christmas worship. The biblical narrative is rich as well. It starts with the Old Testament prophets who foretold the Messiah’s coming, then touches on angels, shepherds, wise men, John the Baptist, Mary, Joseph, and others as it weaves its way through the miraculous Christmas story. The culmination is a congregational affirmation that all of us are called to be messengers of this good news of Christ’s birth and love!